Crawdaunt, The Rogue Pokémon. Its temperament is rough and it loves to fight, but as soon as its pincers break off, it turns cowardly. It stays timid until they grow back. Its pincers often fall off. Unlike with Crabrawler or Clauncher, the meat in its claws is utterly nasty and stinking. Crawdaunt is a Pokémon that really shows what a good ability can do for you. Having one of the best offensive abilities in Adaptability and good STAB coverage with Water and Dark, Crawdaunt is a powerful wallbreaker that can even see play in a standard setting due to its huge power. 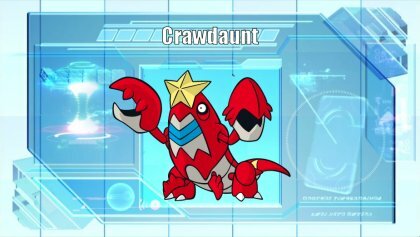 However, Crawdaunt isn't a clear stand-out Pokémon as it is held back by low defenses and terrible Speed, making it very reliant on priority and offensive pressure. Access to Swords Dance allows it to boost effectively so this isn't a problem that Crawdaunt can't deal with, but it does limit the opportunities it has to come in and threaten a team. Overall Crawdaunt is a Pokémon that is capable of ripping apart teams with its powerful STAB moves, but it needs support in doing so and must be used carefully. Offensive Pressure - Crawdaunt brings immense pressure once it get into the field, whether it's forcing a switch or forcing the opponent to sacrifice something to get a free switch in. Neither of these are great options most of the time and with Crawdaunt's high base Attack and Adaptability means that if the Crawdaunt user predicts right, or the opponent is out of reasonable switch in, something is losing a lot of health. Priority - While Crawdaunt's stat spread screams of something that is doomed to forever be bad, Aqua Jet keeps Crawdaunt relevant especially in combination with Adaptability. 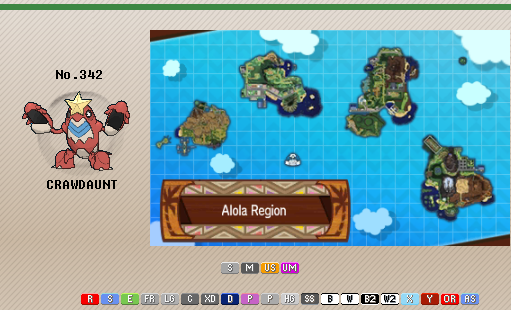 Swords Dance boosted Aqua Jet from Crawdaunt is going to hurt something. Speed - Crawdaunt has really low Speed making it very easy to revenge kill. This is also the biggest block to Crawdaunt being a consistent sweeper with Swords Dance. However, the real issue is that Crawdaunt's Speed makes it hard for it to get into the match in general, as its defenses are also sub par. This makes it very easy to pick off Crawdaunt with anything that can live an Aqua Jet. Typing - This ties into Crawdaunts low Speed, Crawdaunt's Dark typing can hinder it with the plethora of Fighting and Fairies in the meta. 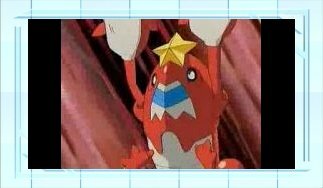 In particular, this prevents Crawdaunt from abusing the most common bulky Water in OU as a switch in, since Tapu Fini's Moonblast wrecks it. 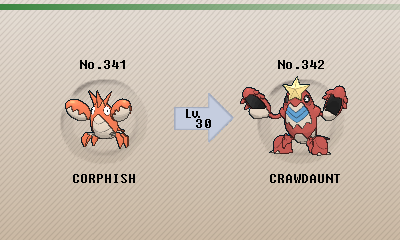 Crawdaunt can also be out-prioritized by Mach Punch from most users of it such as Breloom. Adaptability - Increases STAB bonus to 2x - This is amazing as Crawdaunt's good neutral coverage with just its STAB moves means not that much wants to take a hit switching into the crayfish. Hyper Cutter - Prevents Attack from dropping - Niche but useful, this allows Crawdaunt to be unfazed by Intimidate which is helpful for a physical attacker. However, this is still less useful than simply using Adaptability. Shell Armor - Prevents Critical Hits - Overall a bad ability for something that is too frail for this to ever matter, just stick to Crawdaunt's other abilities. Knock Off is the primary move for Crawdaunt, crippling anything that tries to come in that doesn't have a Mega Stone or Z-Crystal. This can really hurt some foes such as Landorus Therian which lacks any form of recovery without Leftovers. Crabhammer is the primary Water-type STAB, dealing solid damage to most threats outside Water- and Grass-types. Crunch is for a Dark STAB that will hit harder than Knock Off if you don't take off an item, and it can get a defense drop on occasion to put an otherwise reliable check into a tough spot. Lastly, Aqua Jet is used to pick off weakened targets and look to clean up after a sweeper late game. Maximum offensive investment with a Choice Band turns Crawdaunt into a nuke that can really punish defensive foes. The Speed investment ensures Crawdaunt can actually do this efficiently since Crawdaunt is very slow by wallbreaking standards. Adaptability simply boosts the damage output of its STABs further, this is a no-brainer on a set only utilizing STAB moves. Life Orb - Crawdaunt can make effective use of a Life Orb given it's already relatively frail, so it won't mind the recoil too much. Giving up some power for Choice Band hurts but being able to double tap something with Knock Off or Crabhammer with Aqua Jet makes Crawdaunt a bit more self-sufficient. However, the recoil will still bring it down eventually so be careful using it against sturdy defensive teams that can potentially outlast it. Swords Dance - Typically used with Life Orb, Swords Dance can fix up the problem of not being able to break through defensive foes efficiently. It can also turn Aqua Jet into a powerful cleaning tool, but this demands some support in the form of entry hazards to pull off effectively. Volt Turn - With Crawdaunt's low Speed, Volt Switch and U-Turn support is really nice for it. Assault Vest Magearna is one of the best options as its lower Speed gives Crawdaunt a relatively safe Volt Switch, and it can switch into some big threats for Crawdaunt such as Tapu Fini, Tapu Lele, and Greninja. Greninja itself is also a good teammate as it can drop Spikes to create more KO potential for Crawdaunt, but its faster U-Turns are a bit rough as it means Crawdaunt will often be taking the hit as it comes in. Scizor is also great as it can scare Fairies and can set up on Tangrowth and other Grass threats that scare Crawdaunt, and also has slow U-Turns. Likewise Landorus Therian is a great option with Stealth Rock support as well as Intimidate to soften physical hits on the way in, there's a reason Landorus Therian is everywhere. Tapu Fini - With resistance to Water and Dark, Tapu Fini is a solid answer to Crawdaunt. While it can't simply Scald burn Crawdaunt like other bulky Water-types, Moonblast will easily beat Crawdaunt outright while Natures Madness just cripples Crawdaunt or any potential switch, especially if Stealth Rock is in play. Tangrowth - Resisting Crabhammer and Aqua Jet and having huge Defense, Tangrowth is a strong answer to a lot of threats like Crawdaunt. Regenerator also means that Tangrowth doesn't care as much about Knock Off, though can hurt down the road, especially if Crawdaunt is paired with Tapu Koko as without an Assault Vest it can struggle to keep up. Trade from Diamond, Pearl & Platinum. Trade from White, Black 2 & White 2 (Black). Trade from Ultra Sun & Ultra Moon. Crawdaunt has made a few appearances in the anime. Moist notably, it was used by a Team Aqua.